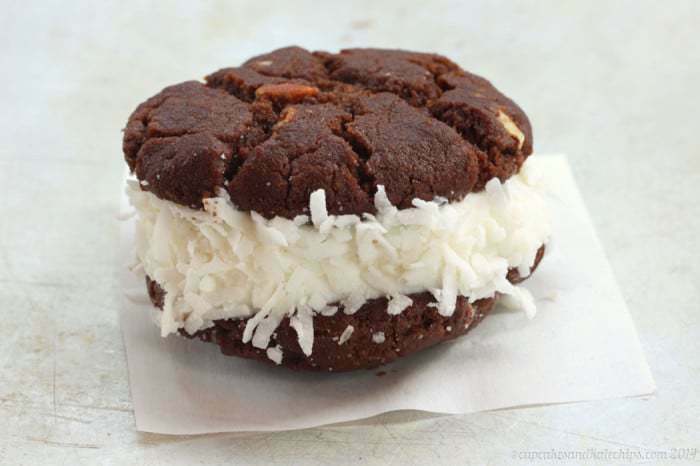 Experience the "joy" of a favorite candy bar in a frozen dessert form with yummy coconut gelato or sorbet sandwiched between two fudgy, nutty cookies. 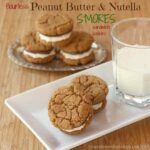 Experience the “joy” of a favorite candy bar in a frozen dessert form with yummy coconut gelato or sorbet or ice cream sandwiched between two fudgy, nutty cookies. 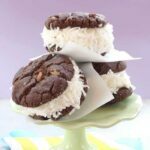 For a frosty treat, it doesn’t get much better than Flourless Chocolate Almond Coconut Ice Cream Sandwiches. Up through fourth grade, I went to really small schools. We didn’t have a cafeteria in either, so when I went to the local public school in fifth grade, a whole new world opened up to me. A world that involved being able to purchase ice cream at lunchtime. This was epic! I think I convinced my mom to give me fifty cents to buy a chocolate eclair bar about once a week. Then, as a realllly special treat, I could occasionally get a dollar out of her to buy one of those packages chocolate chip cookie ice cream sandwiches. This was like heaven to me. Same thing happened when we used to go to the community pool in the summer and the ice cream truck would show up. My sister and I were allowed to get popsicles or Italian ices or ice cream bars most days, but sometimes, just sometimes I could get that chocolate chip cookie sandwich. Heaven! The cookies alone are ridiculous. Fudgy and chewy (and gluten free, since they have no flour at all), with a little bit of crunch from the chopped almonds. Then smush some creamy coconut gelato between them, and now you’ve taken things to a whole new level. I mean, chocolate, almond, and coconut is just such a perfect flavor combination (ahem, Almond Joy anyone? ), and in my world, ice cream makes everything better! I bought my gelato, but if you want to whip up your own, go for it. 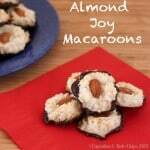 You could even use sorbet or make a coconut milk-based ice cream, and then these are complete dairy free! Bake for 10-12 minutes, or until set but still slightly soft to the touch. Cool the cookies on the baking sheet for about 10 minutes, then transfer to a wire rack to cool completely. Remove gelato or sorbet from the freezer to soften slightly. Sandwich about one-quarter cup of gelato or sorbet between two cookies. If desired, roll the edges in coconut. Place the sandwiches in the freezer until ready to serve. 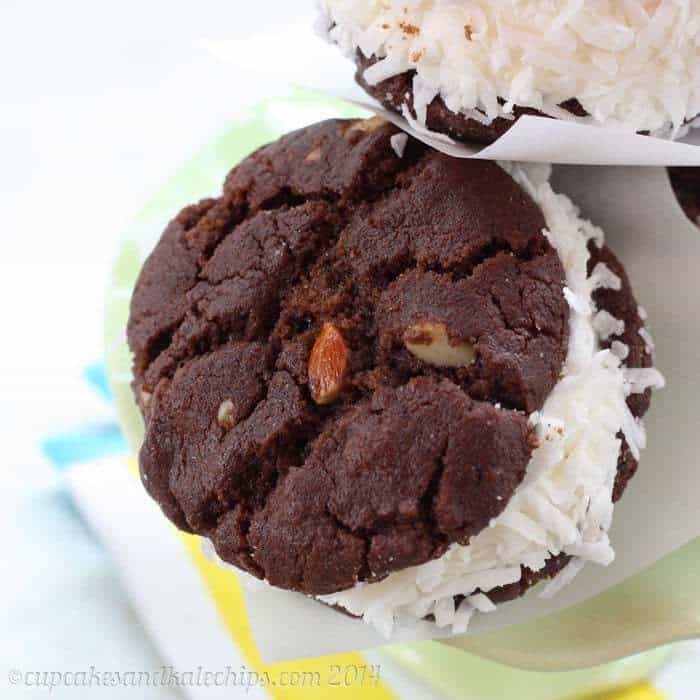 Enjoy this Flourless Chocolate Almond Coconut Ice Cream Sandwiches Recipe! 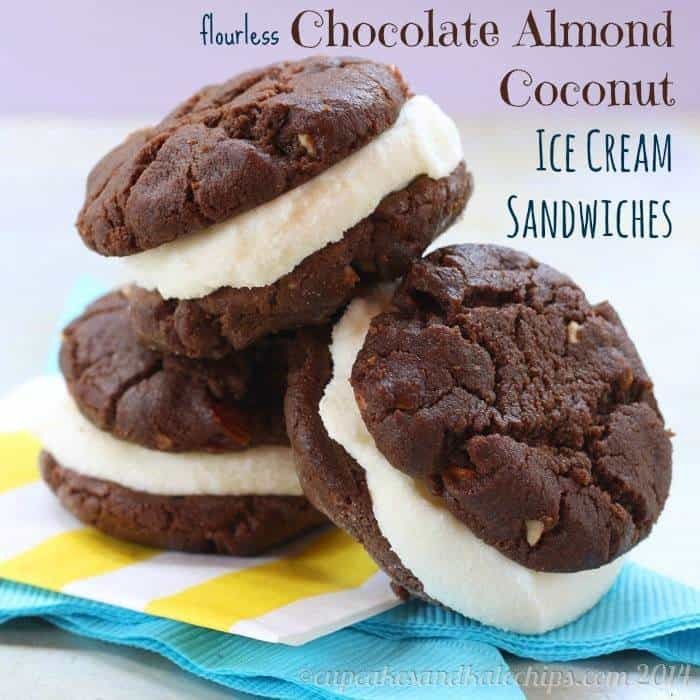 These ice cream sandwiches look delicious, I’m definitely going to have to try this recipe! Thanks! I finished the last one last night, and they were super yummy! Enjoy! Well, it isn’t actually a THING except for when crazy food bloggers make it a thing 🙂 Thanks! Amazing recipe. Nothing better than chocolate! 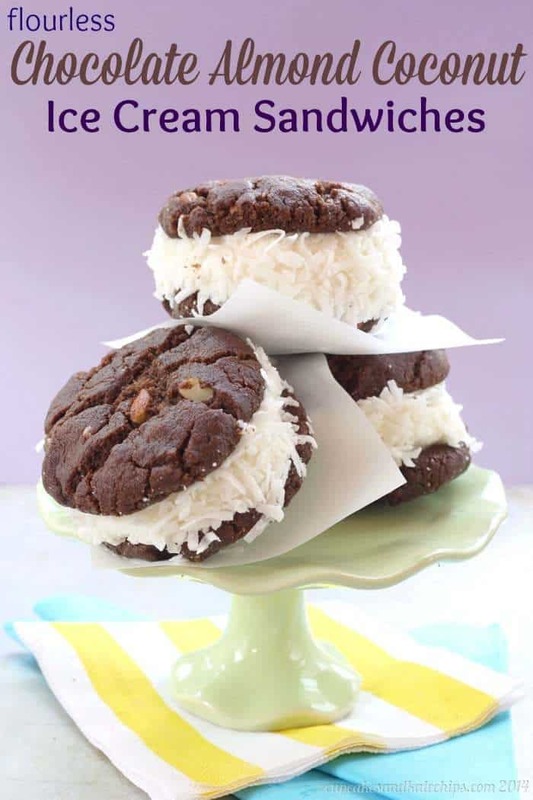 Chocolate….Almond….Coconut…..Ice Cream…..Sandwiches, yup you have ticked off all the boxes for me!! Love these!! Brianne, these are fantastic!! My husband would love them for sure and your pictures are just gorgeous! Mouthwatering :). Thanks for sharing!! Thanks so much! I had fun with the photos! My favorite ice cream is mocha almond fudge. haven’t had coconut in a while. these look great! My school didn’t serve lunch either (not until I went to high school did that become an option for me)! i can never go past a good scoop of vanilla bean ice cream, its delicious by itself and also can be paired with everything! these ice cream sandwiches look delicious, definitely craving a bite right now. Mmm chocolate almond coconut. Sounds good to me! 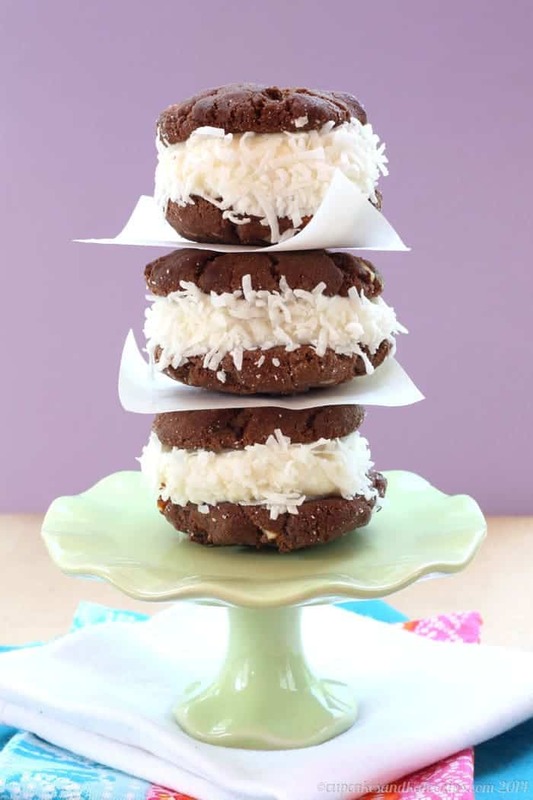 Whoa, I would not be able to say no to one of these chocolate coconut babies! Extra coconut on mine, please!! !